The wholegrain healthy breads are best made at home and it is even better if the breads are made using sourdough. Sourdough is a pet and one can keep them forever. Isn't that a great feeling? I freeze my sourdough when I am not using it as this sometimes stretched to a couple of years. I think I had not baked any breads for a year at least. But the sourdough survives when you freeze it. Sometime ago someone wanted sourdough starter from me and I promised her that I will revive the sourdough starter for her. It took just 2 days to revive the sourdough and the good thing is that my love for sourdough breads also got revived. While I baked some ragi sourdough bread, I kept using it for my kulchas and pancakes too. Then I thought of making the sourdough millet crumpets and crumpet sandwiches. 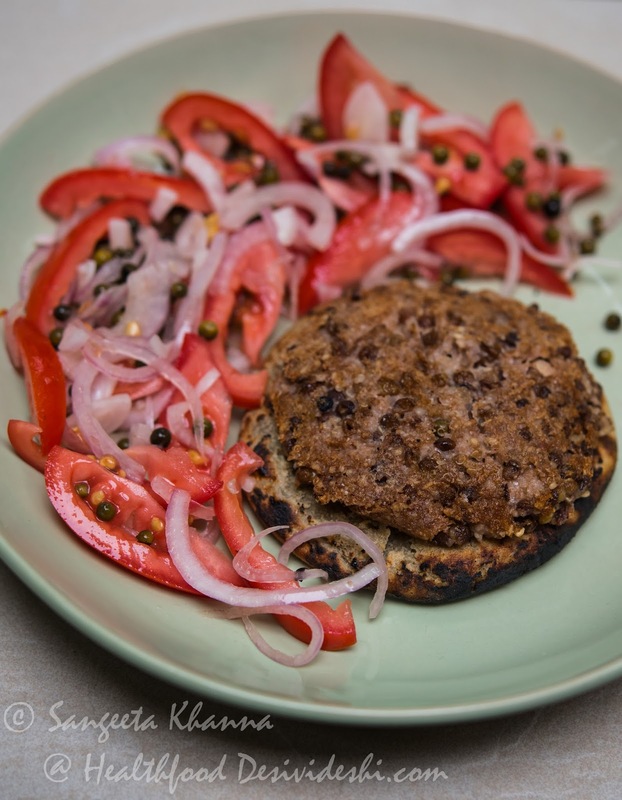 We normally love the crumpets with any cheesy topping or even with slices of cucumber and some feta cheese but this time I thought of making some quinoa and lentil patties for this. 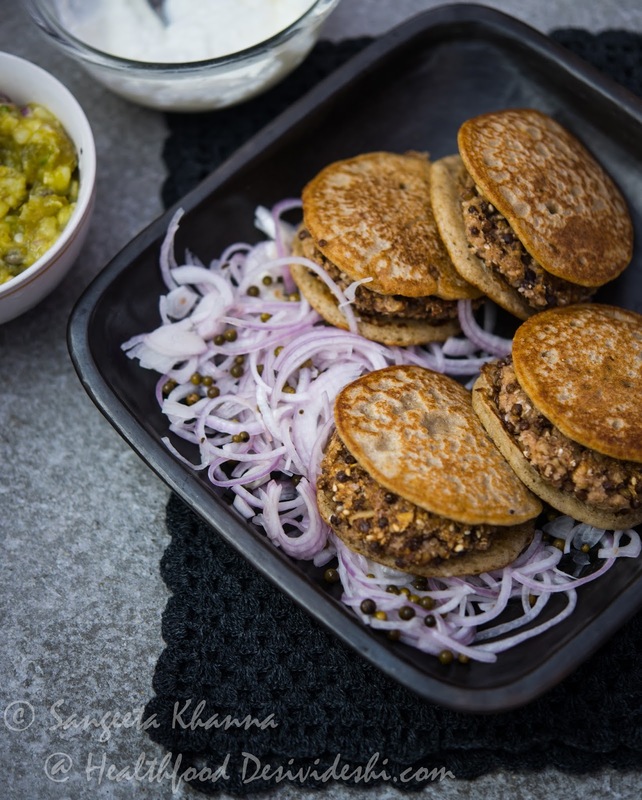 Quinoa and sweet potato burger patties have been appreciated much on my table but this time I thought of making use of cooked whole masoor dal (red lentil with skin) to make the patties. The idea came from the salad I had made with quinoa and lentils with grated carrots (much like this quinoa carrot salad) earlier but the decision of making the patty was not a very good idea if you consider proper binding. But then the taste of the first trial of this quinoa and lentil patty was so good I decided to do a better version that stayed as delicious but could retain the shape too. The result was something almost all my home cooked meals stand for. 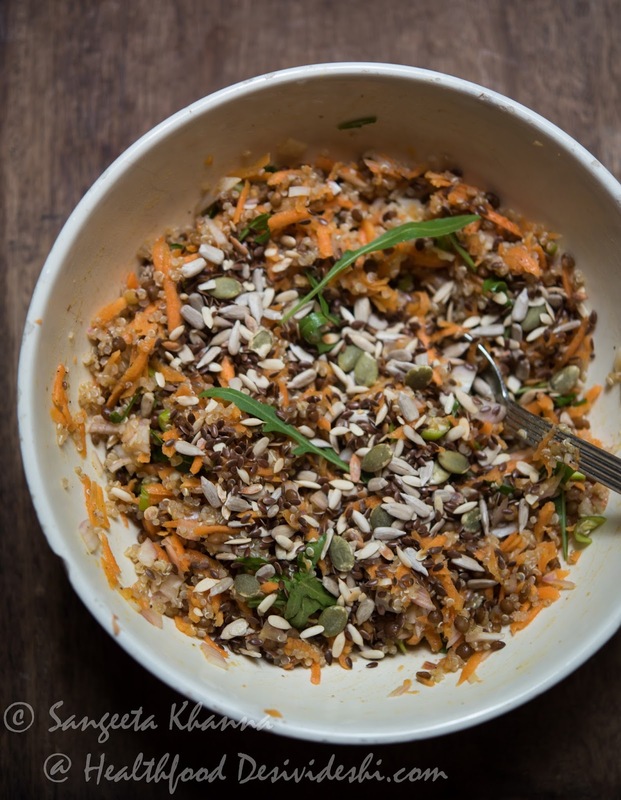 My meals have to be low Glycemic and I love including all sorts of millets in my meals. This one turned out to include several of those millets and alternative grains. Mix everything listed in the crumpet ingredients list to make a sticky dough and let it rest for a slow fermentation. I generally keep it at room temperature for an hour and then refrigerate for up to two days. Use when required. Drop about 60 ml of the thick batter on greased hot griddle to make one thick flat crumpet. I generally use my fingers to drop the batter as it is more of a sticky dough. Just pick up a portion using your fingers and drop it in a neat lump on hot greased griddle. It will flatten by itself and rise, ultimately making small holes on the surface. Flip to toast the other side. Soft cooked crumpets keep well in the refrigerator and can be toasted when required. Mix everything on the list of ingredients for quinoa lentil patties. Knead well to make a coarse but binding type soft mix. Divide in about 12 portions and shape into flat patties. Grill the patties on a hot griddle greased with ghee or butter. Sandwich between 2 freshly toasted crumpets and serve immediately with some salad and some dip on the side.. I made a onion and pickled green peppercorns salad with this and the salad turned out to be a perfect companion to these crumpet sandwiches. We also had some parval ka chokha dip, mixed with a little mustard and another hung curd and garlic dip. Sometimes people think eating seasonal food is a limitation but it can be a great way to discover new combinations when you prefer eating seasonal fresh produce. We don't eat raw leafy greens in Indian monsoons but there is no dearth of salads. By the way, you might like my column in Indian express about Indian salads. 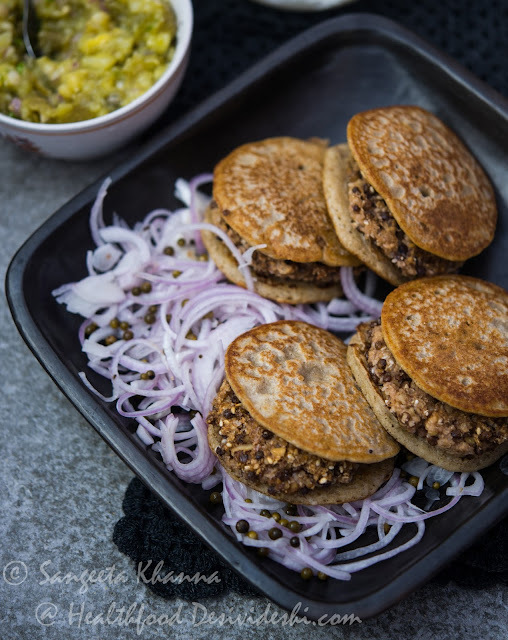 I even tried this quinoa lentil patty with a bajre ka rotla (a thick flat bread made of bajra or pearl millet dough, unleavened) and loved it. There is something about unspoiled natural foods that makes them delicious, more because they have not been stripped off their natural goodness. This time I added some tomatoes to my onion and pickled green peppercorns salad. To make the salad just mix onion slices with brine pickled green peppercorns and some extra virgin olive oil and toss. No need to add any salt, vinegar or additional pepper. It doesn't matter if you can't think of baking a loaf of bread for any reason, you can still bake your breads really conveniently using sourdough or yeast and enjoy freshly baked breads everyday.